Crochet tutorial that teaches you how to crochet the peacock stitch. This stitch’s texture is the first thing that catches the eye! It’s great for making things for babies, children, men and women. Then you think hummm what can I make from it? Great question! How about an afghan or a purse? Or a fun textured vest or sweater. Or a little girl skirt! I hope you can find something to make with this stitch. If you do, then please come over to the Facebook group Crochet 4 the Masses and share it with us! The stitch tutorial includes a left and right handed video tutorial. 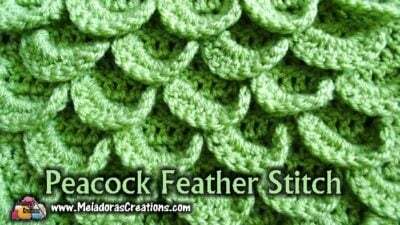 Use any yarn and hook size to make this beautiful stitch. If you enjoyed this crochet tutorial you might also enjoy more from Meladora’s Creations.